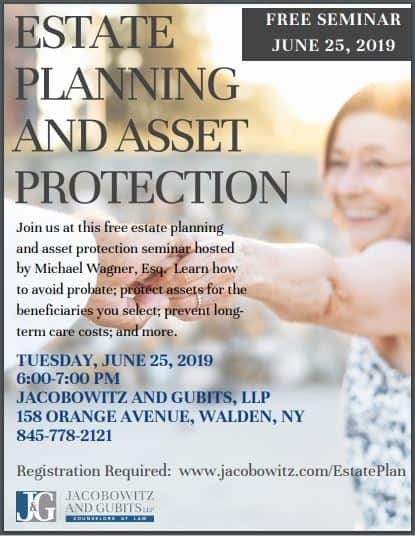 You and a guest are invited to join us for this free Estate Planning and Asset Protection Seminar on June 25, 2019 at 6:00 PM at J&G, 158 Orange Avenue in Walden, NY. Register Here – Seating is Limited so reserving your spot is required. Presented by Michael Wagner, associate attorney at Jacobowitz and Gubits LLP who concentrates in estate planning, elder law, wills, trusts, and probate. He is a senior advocate.